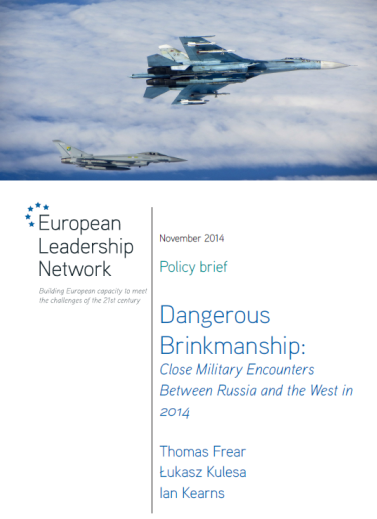 European Leadership Network has put together a good analysis in their new title Dangerous Brinkmanship: Close Military Encounters Between Russia and the West in 2014 (a free 20-pages PDF). It covers nearly 40 incidents between the West and Russia during 2014 that seem to be getting more dangerous. The incidents are categorized as “High Risk Incidents”, “Serious Incidents with Escalation Risk”, and “Near Routine Incidents”, with respective counts for the categories as 3, 11, and 25 incidents. The brief is compact and includes an interactive map included also here below. This publication is therefore something that is of the category: “Must read – No excuses”. I recommend a careful reading of this and also looking up the references. I have previously blogged Swedish Skipper‘s praiseworthy summary of the events of last three years, now available in three languages: Swedish, English and Finnish. These two texts support each other well. Skipper’s take on the events is especially from the viewpoint of the Baltic Sea, Sweden and security policy. Frear, Thomas ; Kulesa, Łukasz; Kearns, Ian . Dangerous Brinkmanship: Close Military Encounters Between Russia and the West in 2014. European Leadership Network, November 2014. Direct link to the PDF. The Russian leadership should urgently re-evaluate the costs and risks of continuing its more assertive military posture, and Western diplomacy should be aimed at persuading Russia to move in this direction. All sides should exercise military and political restraint. All sides must improve military-to-military communication and transparency. To perpetuate a volatile stand-off between a nuclear armed state and a nuclear armed alliance and its partners in the circumstances described in this paper is risky at best. It could prove catastrophic at worst. This is a translation of a blog post by Jyrki Kasvi on 26 October 2014: “NATO, vai ehkä sittenkin orpana, kyty, näälämies, käly tai muu serkku“. Kasvi is a former two-term member of the Finnish parliament, doctor in engineering, and a well-respected expert on IT in the political arena. He is a member of the Greens of Finland. The war in Ukraine has made security policy again timely in Finland. After the Cold War, the defense policies were interesting to only a few politicians who were thought … a bit old-fashioned. I myself was accusing the official Finnish defense strategy for focusing on rusting cannons and tanks and neglecting the cyber defenses. Now those artillery units and tanks are at the European borders again. At the same time there is a battle between the values and attitudes of Europe and Russia. The war in Ukraine has been called a hybrid war where traditional warfare is combined with a combat over truth, opinions, impressions and values waged in the computer networks and media outlets. One of the theaters of this war is Finland. At the same time, NATO, that dinosaur of the Cold War, has been kicked awake from its hibernation. The collapse of the Soviet Union and the breakdown of the Warsaw Pact made many of us forget all about NATO. It was only Russia who never lost sight of it; it was still viewed as the old archenemy. Russia was regarded in the West as a whole different beast than the Soviet Union, but to many Russians the Soviet era was only a phase in the long history of Russia. When an empire has millennial history, mere 69 years is viewed differently. Even the Romanovs ruled in Russia over 300 years. The war in Ukraine forces Finland into a complete reassessment of the principles its security and defense policies and strategies are based on. This re-evaluation should cover the general conscription, area defense strategy as well as its current no-alliance position. I trust that there are people much better-informed than me already sitting in councils discussing the teachings of Ukraine for us. However, the security policy is too important of an issue to be left to be discussed only in our ministry of defense and the Defence Command. Should Finland want to retain a believable defense, we must make it a priority also in the state budget. Finland actually has a surprisingly well-equipped army. Its air forces especially are among the ones with the best strike capabilities in the Western Europe – that is until Eurofighters and Raptors become the norm. In addition, Finland has as many mortars as Germany and more field cannons than any other EU country except Greece. I, among many others, saw some years ago that a general-conscription army and an area defense plan are not feasible with shrinking age classes and warfare becoming increasingly technical. With declining birthrates there simply wouldn’t be enough soldiers to cover entire Finland, nor could everybody be adequately equipped. And would a potential attacker really want to divide their troops all across the country – or would they only seek to capture the strategic targets and leave the area defense forces alone in their tents in the woods? Earlier Finland’s wartime army was to be 750,000 men strong; now we are looking at 230,000 men. Modern combat gear for 230,000 costs more than 2 billion euros, if we use US infantry men as a benchmark. In the next few years the price tag will only go up with the new tech becoming the standard: night-vision goggles, combat computer, micro drones, etc. Furthermore, there are the upgrades due to the artillery and equipping the air force, the navy and the cyber troops need their shares, too. For instance, it will be extremely expensive to replace Finland’s 64 Hornet F-18 fighter jets – that is if we want actual fifth generation fighters that could carry us through the 2030s. If the Russian Su T-50 doesn’t hit the markets soon, the only options in practice would be F-22s and F-35s, should USA be willing to sell them to us. The more likely option for Finland is to settle for the planes of the so-called 4.5 generation. Swedish JAS Gripen NG looks very interesting among them. Brazil decided to purchase 36 of them just last winter. The trade price of 3.6 billion euros was considered low as it covers the supporting services, training and spare parts. However, Gripen having limited stealth capabilities will be vulnerable, e.g., to Russian S-400 air defense missiles that have that huge range of 400 km. On the other hand, Gripen NG has less signature in the visual and IR wavelengths than F-35 would. And Finland is also looking to replace the majority of its heavy naval vessels. Border infractions are not limited to airspace violations, but take place also under the surfs. The non-personnel expenses are estimated to be about 15 billion euros in the next 15 years. The first of the fundamental questions for the Finnish defense is whether we stick to the area defense covering the whole country or not. If the answer is yes, general conscription is the only viable option. In fact, as the age classes are getting smaller, more conscripted are needed and the conscription needs to be expanded to women. This leads to a large increase in the needed funds so that also women can be given both the training and modern war gear. The area defense doctrine is well-suited to repel the ‘small green men’ we saw in Crimea. ‘Unfactioned’ troops can only claim territories if there are no troops capable of resistance in the area. Ukraine’s army, however, had troops in Crimea, but for some reason they never left their barracks. At the same time, we must revise what the civil service is for those declining from armed service. They must be given training supporting national security instead of moving storage boxes. That training could be in rescue operations or in other tasks relevant to a crisis situation. The next security threat that Finland faces may not be a military conflict and troops with only military training would have limited use. For Finland, the military doctrine of area defense is fundamentally tied to the conscription. If that doctrine is to be upheld, general conscription is practically the only way to maintain sufficiently large reserve. Instead, if that is to be done away, the option of a well-equipped professional army is back on the table. Replacing quantity with quality may not reduce the costs; however, the number of working years would increase if the military service wasn’t taking 165 to 347 days (plus days spend on drills) of each man (and soon woman, too). Another fundamental point is Finland’s policy of military independence. Finland got through the Cold War by maintaining that policy and repeating as a mantra: “neutrality and no alliances”. The echo of the mantra is still ringing. During the years of finlandization, NATO was vilified. Or as a Finn off the street recently said to a Finnish newspaper: “I have been always told, since my childhood, that NATO isn’t good.” But not even the staunchest Finnish communists could suggest with a straight face that we should join the Warsaw Pact. That would have been an obvious shelter from the threat of the imperialistic NATO, right? One of the cornerstones of the no-alliance doctrine up to the 80s and 90s was the idea that Finland would face a military threat only as a part of a much larger conflict between NATO and the Warsaw Pact. That was why it was thought that we could manage with an outdated fleet of Drakens and MiG-21bis’es, because the best equipment would be tied elsewhere. Ukraine (as well as Georgia and Iraq) have shown us that modern wars can be limited to local theaters, also in Europe, and that the best equipment is used. What we saw in Crimea was nothing short of Russian elite troops: well-trained and well-equipped special troops. The recent actions by Russia have increased the favorable views towards NATO membership in Finland. The violations of human rights, the rise of nationalism, ‘creative’ rewriting of history, ‘creative’ news reporting, the military buildup, airspace violations, frozen conflicts and the territorial annexations by Russia have all stirred up many concerns. Will Russia decide next to protect the descendants of the Russian Empire living in Finland from the ‘fascist junta’ of Helsinki? South-eastern Finland, however, doesn’t have weapons manufacturing that would be important for Russia like Eastern Ukraine has. The most troubling thing about Russia these days is that it really is a loose cannon. There are many who think that NATO membership would rein in Russia at the Finnish border, but the membership of Estonia hasn’t stopped Russia from getting aggressive there. Instead, the NATO membership has now brought fighters to the Baltic airfields from other NATO countries to keep checks on Russian planes. If Finland were a NATO member, Finnish Hornets would be taking their turns at the Zokniai base in Lithuania. On the other hand, there are many Finns who shirk from NATO led by the United States pretty much for the same reasons as they are worried about Russia: the war in Iraq, Guantanamo, NSA, ‘unusual methods of interrogation’, Abu Ghraib, … Both the East and the West have their sins. Estonia, Latvia and Lithuania are poignant demonstrations how the NATO membership does reduce the likelihood of Russian military interventions. We have recognized this in Finland and we have long participated in the NATO partnership programs and joint exercises [they haven’t required official changes in our defense doctrine]. But how long can Finland be sitting on a fence – inching ever closer to NATO without seeking its membership? The condom Finland uses in its NATO relation is very thin, but it keeps us from the fifth article of the NATO accord: the article about joint defense. Finland hasn’t committed to helping a NATO member under an attack nor do NATO countries have any obligation to help us if we are attacked. In a perfect world one wouldn’t be forced to consider military defenses. In a perfect world there would be allies who don’t ask for moral compromises. Unallied Finland would be just that: it would be ALONE, if a military conflict were to happen. One of the things to learn from the Crimean invasion is that it does you no good to be asking for help when you are in a crisis. NATO will not come to your rescue. Ukraine has been a peace partner with NATO just like Finland, and both Ukraine and Finland have conducted joint combat exercises with NATO. For me, there are two major issues with NATO: USA’s major role in NATO and how the US security policies are lead by the US President. The internal politics of USA can direct NATO policies as well and the US policies are very much dependent on the person sitting in the White House. The NATO of the 90s is quite different from the NATO of 2010s. During the war in Bosnia, I was for the Finnish membership in NATO, because NATO was the only entity with a will and ability to stop a genocide that was then taking place in Europe. EU was not suited to deal with it nor were the European NATO members without the US support. Then Bush the younger replaced Clinton as the US President and I was turned to oppose joining NATO by Bush’s militaristic stances. Now I am again between two difficult options. NATO is practically the same as the United States with its European buddies. If Europe were an equal partner in NATO, my mind would be much more easily set. Despite its 200 billion yearly budgets for defense, Europe has been forced to turn to US for help every time when Europe has had a security problem. 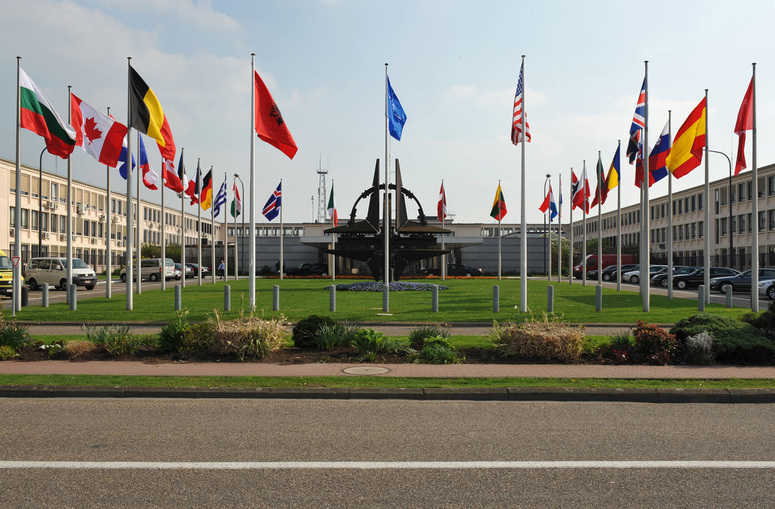 The European NATO countries are dependent on the US in several different ways. For instance, the satellite surveillance of NATO relies on US satellites. Likewise, precision weapon guidance systems are fully dependent on the US GPS satellites, at least until Europe’s Galileo system becomes operational. European NATO members have been quickly building their own airlift capabilities after the Yugoslavian breakup conflicts. Nevertheless, the long-haul transports still need American aircraft. Even Finland is participating in the Strategic Airlift Capability program organized by NATO: the program operates three C-17 Globemaster III cargo planes deployed in Hungary. Just in case we have a sudden need for long distance transport of troops to or from Finland. If Western Europe or the EU had their own military alliance, even if it worked very closely with the USA, I would be for Finland joining it; Americans we aren’t, Russians we don’t want to become, let us be European. Instead, joining a US-led NATO gives me a pause. The fact of the matter is that there won’t be a defense dimension in the European Union in the near future; the Western European Union became obsolete in 2011. No military alliances and stepping back from NATO collaborations. No military alliances but continuing with the joint programs of NATO. Joining NATO with all its privileges and responsibilities and preparing ourselves to the repercussions from Russia. First option would be a signal to Russia that its aggression and threats are working: Finland has been scared into its place in the Russian sphere of influence. Continuing with the current status: staying unallied but being so very close to NATO is not without its problems. We risk being left alone like Ukraine in case there is pressuring by weapons or attacks employing hybrid or conventional means. The EU sanctions don’t give much comfort to the minds of Ukrainian solders shivering in trenches in Donetsk. Choosing to continue with friendly relations with NATO while staying non-allied has the benefit of maintaining political maneuverability with regards to NATO’s international operations. We could participate when it suits us like we do now (IFOR, SFOR, KFOR and ISAF) without the kind of political pressure that would be on us as a NATO member. The risk of joining NATO has the immediate risk of political, economic or military reactions by Russia. However, before the back-and-forth sanctions between EU and Russia, there was much trade that Russia conducted with Poland as well as the Baltic countries, even though they are member states of NATO. 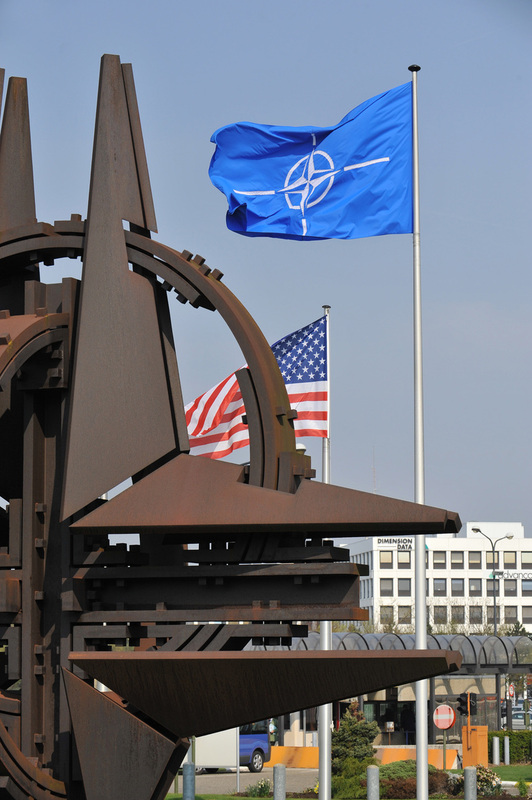 The long-term threat of NATO membership is the political commitment to the possible military actions by NATO. Even though each NATO country decides their participation in joint operations independently, withholding our participation would limit Finland’s weight at the tables in the NATO headquarters and in its decision making. Also Finland would bear the burden of moral responsibility over the NATO decisions to use force or even possible human rights violations by NATO troops. The benefit of the NATO membership is the fifth article: NATO members have a responsibility to assist and support Finland if its faces a direct attack or pressuring by force. So what do I think of Finland joining the North Atlantic Treaty Organization? We should be able to discuss it in a civilized manner as one topic among others. The Soviet Union has been gone for over 20 years! It is symptomatic to see how much extra weight words like ‘NATO’, ‘Russia’ and ‘finlandization’ carry for us Finns. Only after a well-informed public discussion can the Finnish people form a reasonable personal opinion on the NATO membership. It is a task for each person themselves, because a matter like this can only be decided with a popular vote. Personally, I am reluctant to voice my opinion, because I feel it isn’t quite finished. As a politician and with the upcoming parliament elections in view, I do not have the luxury of keeping it to myself. At this moment, for now, based on my current knowledge, I am somewhat more for the membership than against it.